Members of the Canadian Coast Guard Auxiliary, Central and Arctic Region were recognized at the Canadian Safe Boating Awards (CASBA) night. Nancee and Jim Adams of the CCGA, C&A Region´s District 4, were presented with the 2007 CASBA Award as the "Top Volunteers Dedicated to Boating Safety". 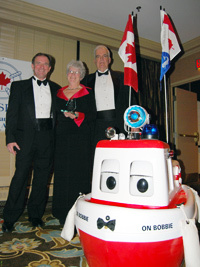 Nancee and Jim Adams have been involved for many years in the promotion of boating safety through their involvement with both the Canadian Coast Guard Auxiliary and the Canadian Power and Sail Squadrons. Nancee Adams is currently the Director of Communications with the Auxiliary for the region and is the District Boating Safety Coordinator for the Auxiliary´s District 4. Jim Adams is the Coordinator of the Bobbie the Safety Boat Program for the region.